The SCM60 MPPT-MB is Mastervolts largest MPPT solar charge regulator. With 600 to 3600 Wp in solar panels, connections for 12, 24 and 48-volt battery banks and an integrated MasterBus connection, this Solar ChargeMaster is perfect for large and medium-sized systems. The innovative technology in the Mastervolt MPPT charge regulators increases the efficiency of the solar panels. 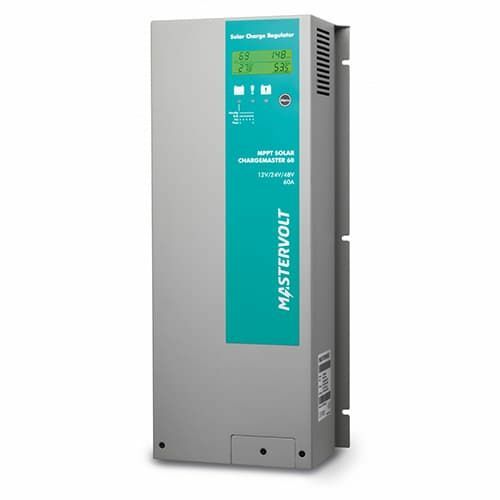 The SCM60 MPPT-MB charges your batteries up to 30% faster than PWM regulators - with the same number of panels. The MasterBus platform brings advanced system functions within reach and makes it possible to follow a complete energy system on a single display. The intelligent one-cable system simplifies the cabling, allowing valuable savings in space and weight. Whats more,you can automate your systems and adapt them to your needs.